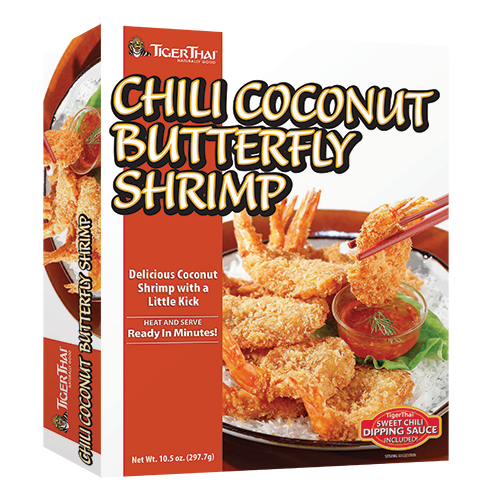 All TigerThai products today are produced from real, natural ingredients and prepared in a way that insures delivery of the highest quality flavor and nutrition. You'll never find chemicals, preservatives, artificial flavors or colors in any TigerThai product. Our Red Curry Shrimp with Rice and Vegetables is an authentic curry dish from Thailand. 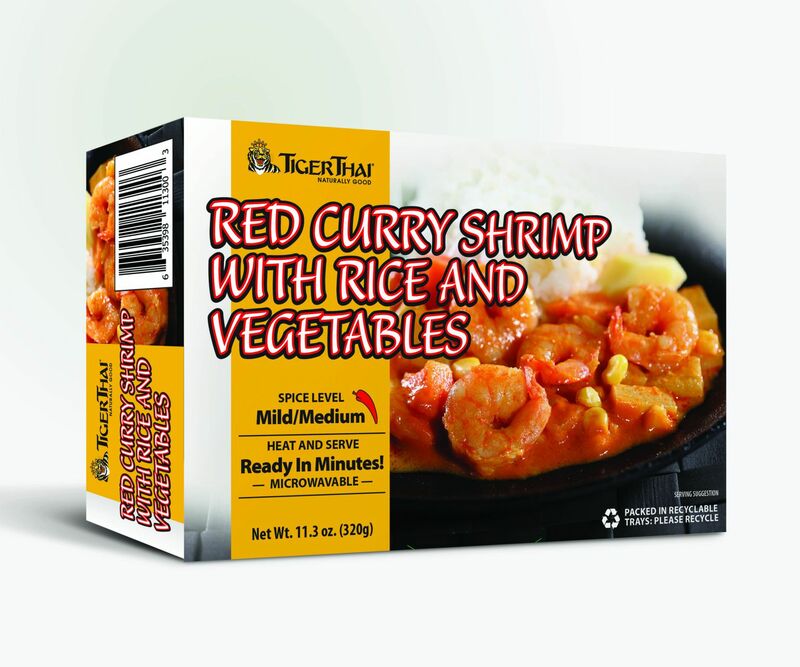 If you like Red Curry you will absolutely love our Shrimp Red Curry. 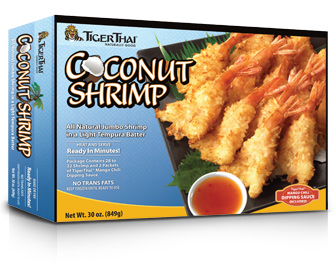 Our original recipe Coconut Shrimp comes from Samui Island, located in the gulf of Thailand. 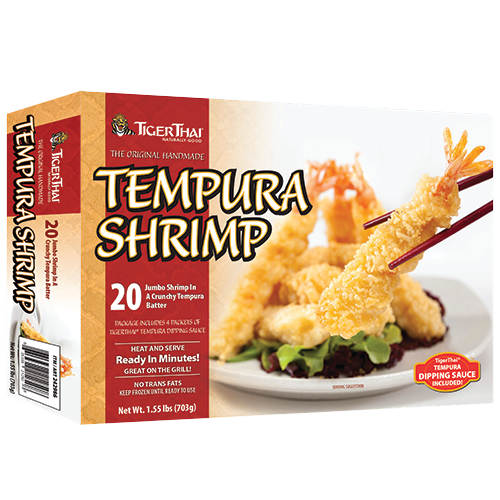 Their famous recipe calls for large fresh shrimp with a gourmet belly cut, a light tempura batter, natural coconut flakes. We also include a Mango Coconut dipping sauce. 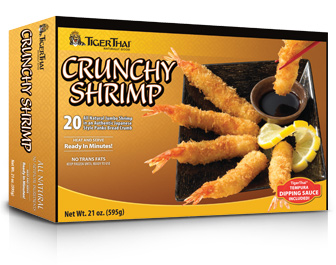 Our Crunchy Shrimp are stretched by hand just like our Tempura Shrimp, but with an authentic Japanese crunchy panko bread crumb that will have you coming back for more. 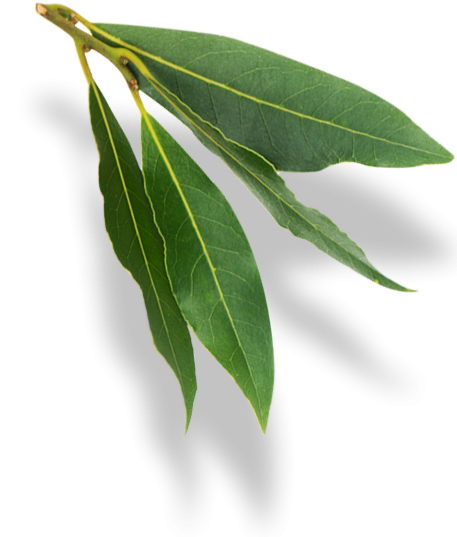 Great as an entree, snack or party food. This delightful product combines a julienne cut of onion, carrot and kale that's formed by hand into a ring, then dipped into a light tempura batter. 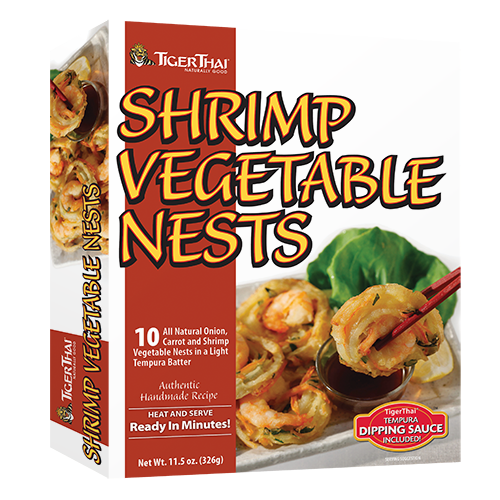 It's topped off with all-natural shrimp and is quite simply unbeatable. A new item from TigerThai, that you can enjoy at home. We have combined just the right mount of chili with our coconut shrimp for all you chili lovers. We even include TigerThai® sweet chili sauce to complete the culinary experience. These delicious shrimp are made entirely by hand, just like your favorite restaurant. 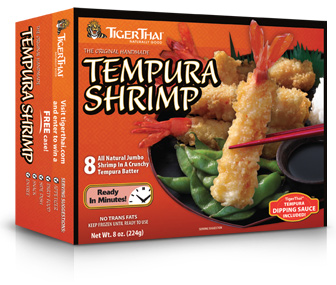 We use all-natural shrimp with an authentic Japanese recipe that's been America's favorite frozen tempura shrimp for over 10 years. Our Tempura Udon Soup is true to the authentic Japanese recipe. 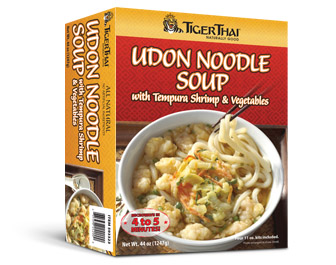 Made with traditional Udon noodles and broth and includes tempura shrimp nuggets. Makes 20oz meal with water added. Ready in minutes on the stove top or microwave. Bake the shrimp tempura according to directions. Clip off tails. In a bowl, mix sour cream and chipotle sauce with a spoon until smooth and creamy. On each tortilla, add coleslaw mixture, 3 avocado slices, sprinkle cotija cheese, 1 piece of shrimp tempura and top with chipotle sour cream sauce. Enjoy! Bake the tempura shrimp or Calamari according to instructions, heat the tortillas then add the lettuce and shrimp. Top with tomato, avocado, cilantro and cheese. Then add sour cream and taco sauce to taste. 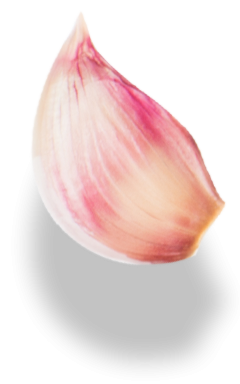 Copyright 2019 RT Foods. All Rights Reserved.